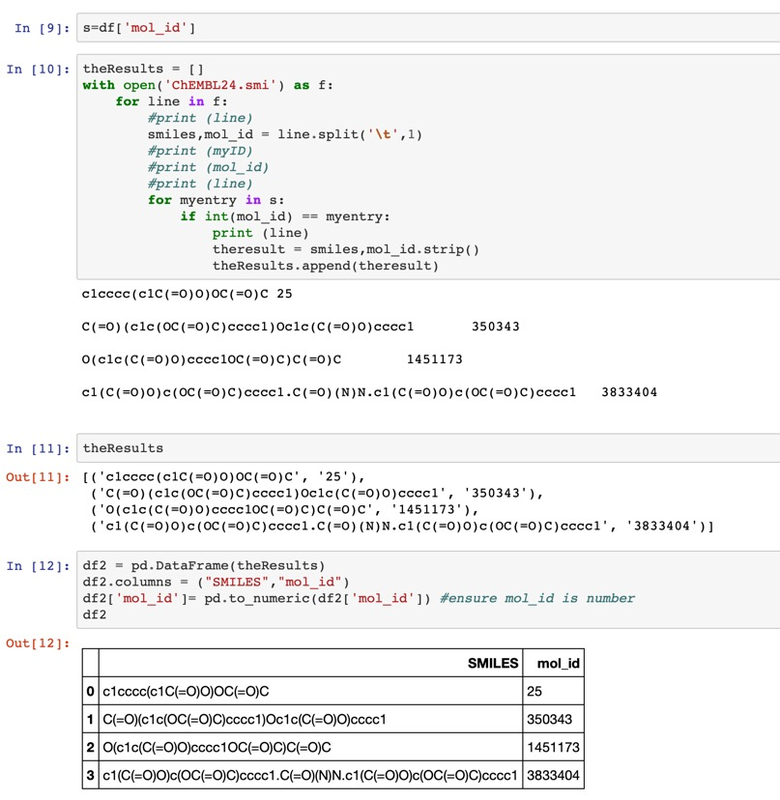 Source code is available on GitHub https://github.com/chembl/FPSim2 and Conda packages are also available for either mac or linux, it requires Python 3.6 and a recent version of RDKit. I've written a page of instructions for installing Cheminformatics tools on a Mac, but if you only want to install RDKit then the best way is to use conda. There is a demo file available for download but I decided to create my own, the entire ChEMBL 1.8M structures in sdf format are available for download https://www.ebi.ac.uk/chembl/downloads. I converted a copy of CHEMBL in sdf format to SMILES using OpenBabel. It is stored in the file named ChEMBL.smi and it contains 1.8M structures. I then created the Morgan fingerprint file ChEMBL.h5 using the instructions on the GitHub site. You can do this from the command line but I created a jupyter notebook to save me looking up the commands in the future. Creation of the fingerprint file took a little while but you only have to do it once. I've also included the commands for creating the file from either an sdf or Python list. Extended-connectivity fingerprints (ECFPs) are circular topological fingerprints designed for molecular characterisation, similarity searching, and structure-activity modelling DOI and are a pretty good default option. The H5 file format is a compressed file format with optimised read speed. 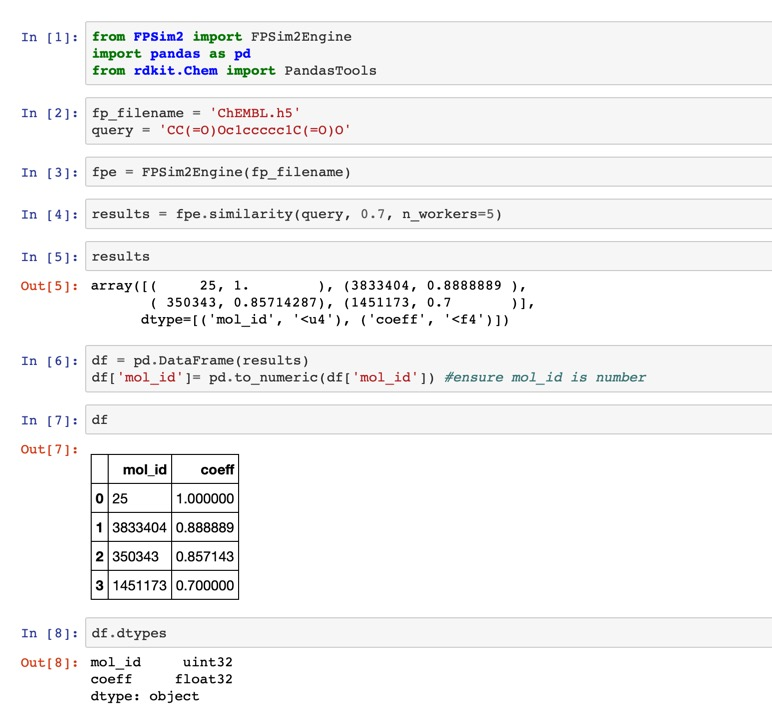 The popular data manipulation python package pandas can import from and export to HDF5 via pytables. Whilst the search can be completed in a few lines of python it returns mol_id and coefficient only, I'd prefer to be able to actually see the similar structures. 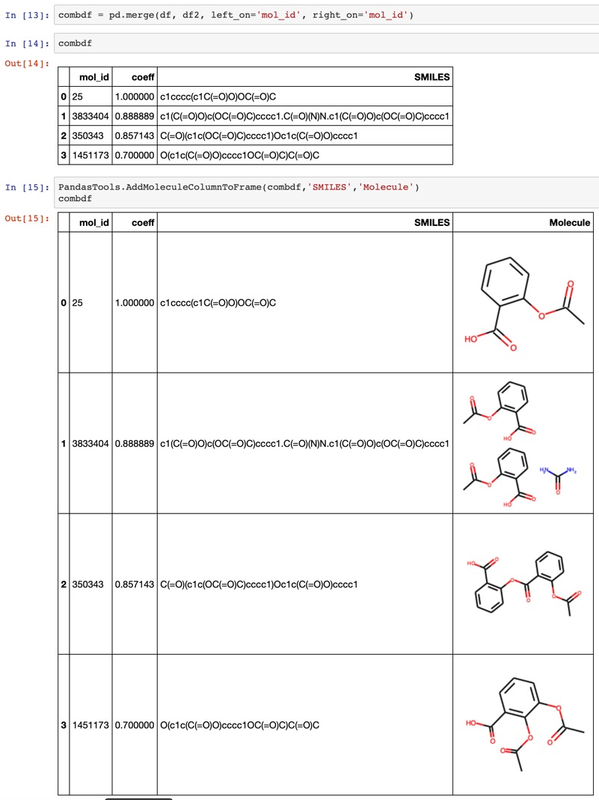 So this notebook does the search and then searches the original file containing the ChEMBL SMILES to get the SMILES string for the similar structures and then uses RDKit to render the structures. We use the fingerprint file created above and input the query as a SMILES string. The similarity threshold is set to 0.7 and we use 5 cores (you can modify this) on my MacPro the search was completed almost instantaneously. The results are then imported into a pandas data frame. Is it possible to either use SMILES, InChi or molfiles as the query. The next step is to get the SMILES strings corresponding to the hit mol_ids. We first select the molid from the data frame and then use these molids to search the original SMILES file as shown below. For each matching molid the corresponding SMILES and molid are copied to theResults. These are then imported into a data frame. Next the two data frames are merged using the mol_id as the key, finally a new column is added using the RDKit PandasTools.AddMoleculeColumnToFrame to render the structure in the data frame. This all works fine, the slow part is the look up of the mol_id to get the SMILES step, for a 1.8M structure file this takes a few seconds, for larger files that might be an issue but I'm sure it could be speeded up. I'd be interested to hear of any suggestions.